TOKYO (Reuters) - Japan, fearing it could be a soft target for possible North Korean cyberattacks in the escalating row over the Sony Pictures hack, has begun working to ensure basic infrastructure is safe and to formulate its diplomatic response, officials said. The hacking of the U.S. unit of Tokyo-based Sony Corp <6758.T> has been seen in Japan largely as an American problem, but the officials said the government is now moving actively to confront the issue after President Barack Obama blamed North Korea and vowed to respond "in a place and time and manner that we choose." Cyberdefence experts, diplomats and policymakers worked through the weekend at Prime Minister Shinzo Abe's office to launch the effort, said one official involved in the process. The government is working to ensure that in response to any threat, its basic functions could continue in the face of any cyberattack, while maintaining such essential services as the power grid, gas supplies and transport networks, he said. He declined to offer details. The government's National Information Security Center, working through various ministries, is pressing companies to improve their security from cyberattacks, the officials said. The attack on Sony by a group calling itself "Guardians of Peace" was the biggest hacking of a company on U.S. soil. In addition to bringing down the computer network at Sony Pictures Entertainment, it also prompted the leak of embarrassing emails and sensitive employee data. Sony executives in Tokyo have declined to comment on the hacking, but a company source, speaking on condition of anonymity, said officials at headquarters were bracing for further attacks prompted by the decision to release the "The Interview". Sony Pictures originally decided to pull the comedy portraying a fictional plot to assassinate North Korean leader Kim Jong Un, as major theater chains canceled plans to show it after hackers made unspecified threats. Sony on Tuesday reversed its decision, announcing a limited release in more than 200 U.S. cinemas. The parent company was "bolstering communication" among Chief Executive Kazuo Hirai, Sony Pictures Entertainment Chief Executive Michael Lynton, Nicole Seligman, who is president of Sony Corporation of America, and Chief Information Security Officer John Scimone, the company source said. Japanese diplomacy has been complicated by the accusations made by its ally, the United States, that Pyongyang was behind the cyberattack. Abe may be forced to choose between backing Washington and keeping talks on track with Pyongyang about Japanese citizens abducted decades ago. "Japan is maintaining close contact with the United States and supporting their handling of this case," Chief Cabinet Secretary Yoshihide Suga said on Monday, adding that Tokyo is sharing information with Washington. 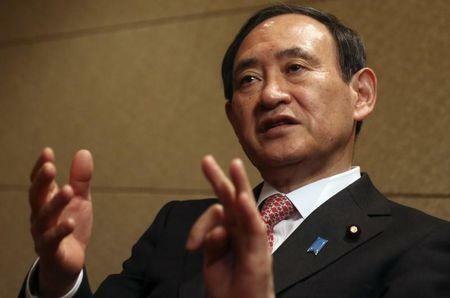 Suga said he saw no effect on Tokyo's talks with North Korea over the abductees. Pyongyang has denied any role in the Sony hack. Japanese officials have acknowledged the government cannot keep up with the proliferating threat of attacks on computer networks from private or state-sponsored hackers. Japan's companies are also vulnerable, with an overall security rating of just 58.5 out of 100, according to a survey this year by cybersecurity firm Trend Micro <4704.T>. Only IT firms and Internet providers got passing marks of 72 or better, while welfare services, medical facilities and transportation and infrastructure networks were notably weak. "There is no way you can guarantee that hackers won't gain access," said Itsuro Nishimoto, chief technology officer at LAC Co <3857.T>, a cybersecurity firm that works with Japanese police and companies. "The only way you can do that would be to shut down the Internet."